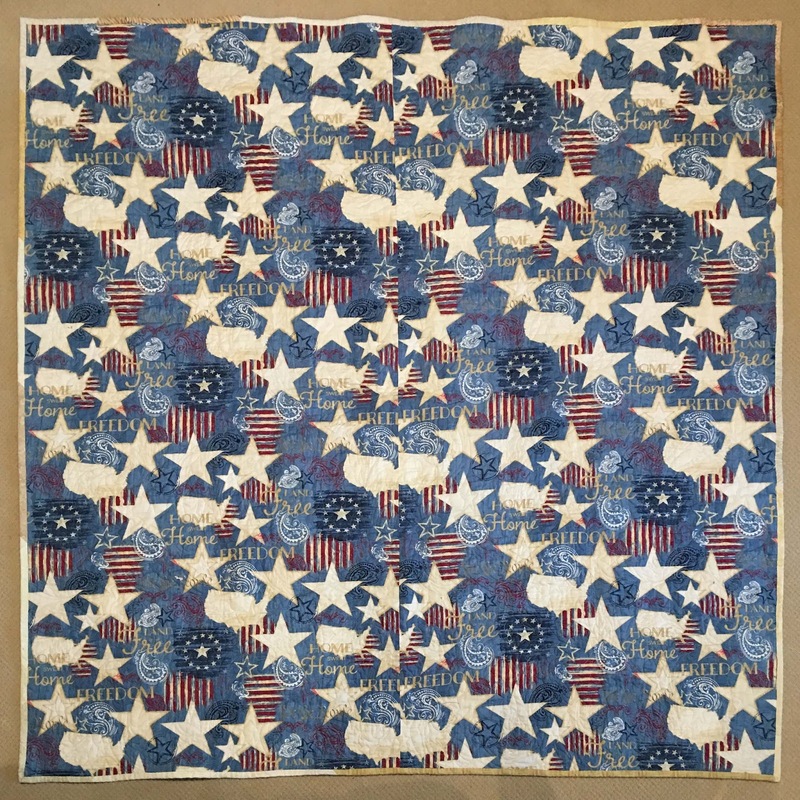 Just put the last stitches on the binding of my Quilt of Valor last night... how appropriate now that it's President's Day! So I just thought I'd indulge myself and show it off one last time, and since none of my work is produced in a vacuum, thank some people who helped me on my way. this is the first one from 2015... it was hanging around the office, relentlessly moving from one design wall to the next, unhappy and unfinished. I have Keepsake Quilting and Wilmington Fabric to thank for offering the "Stripes and Stars" kit that made it look easy to piece stripes and stars with precuts... and it was! 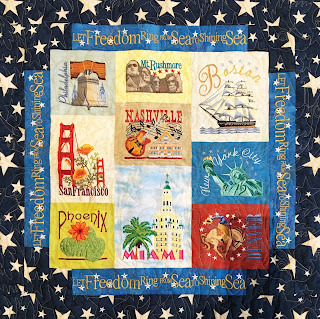 This is the back... Jennifer Pugh's "Colors of Freedom" fabric was included with the quilt, but I also purchased more of this print for the backing. And of course, Sarah Velder at Acorn Ridge quilting does ALL of our longarm work... the woman is a genius and a powerhouse, too. 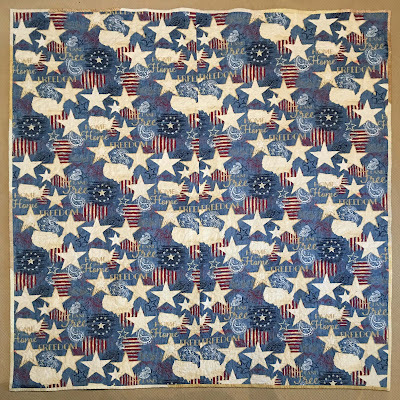 She quilted this overall pattern of eagle heads, flying stars, and waving stripes on the quilt. 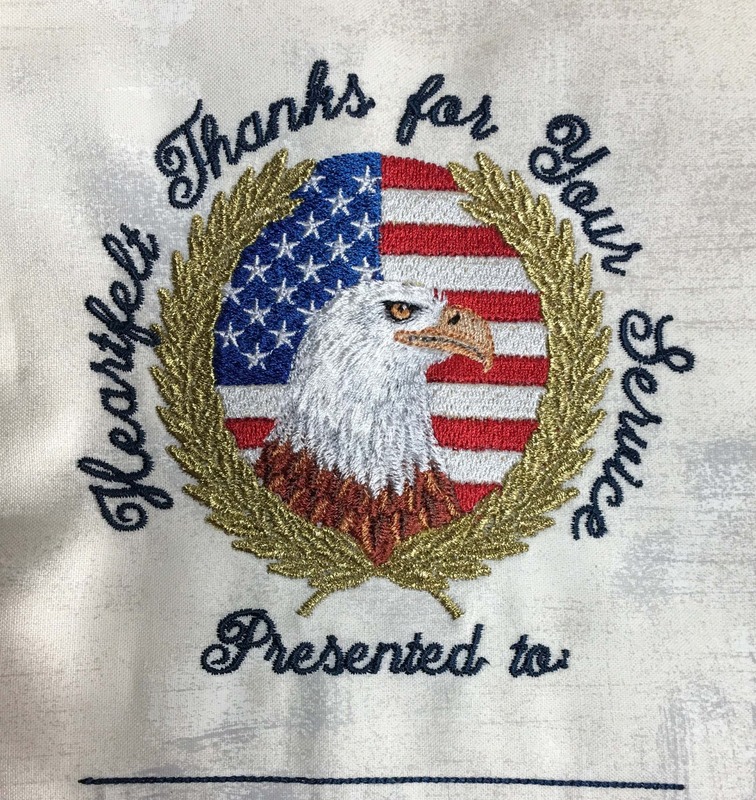 I was afraid it would be too crazy, but she picked just the right thread color that wouldn't show too much on the embroidery but you could see it distinctly in other places. 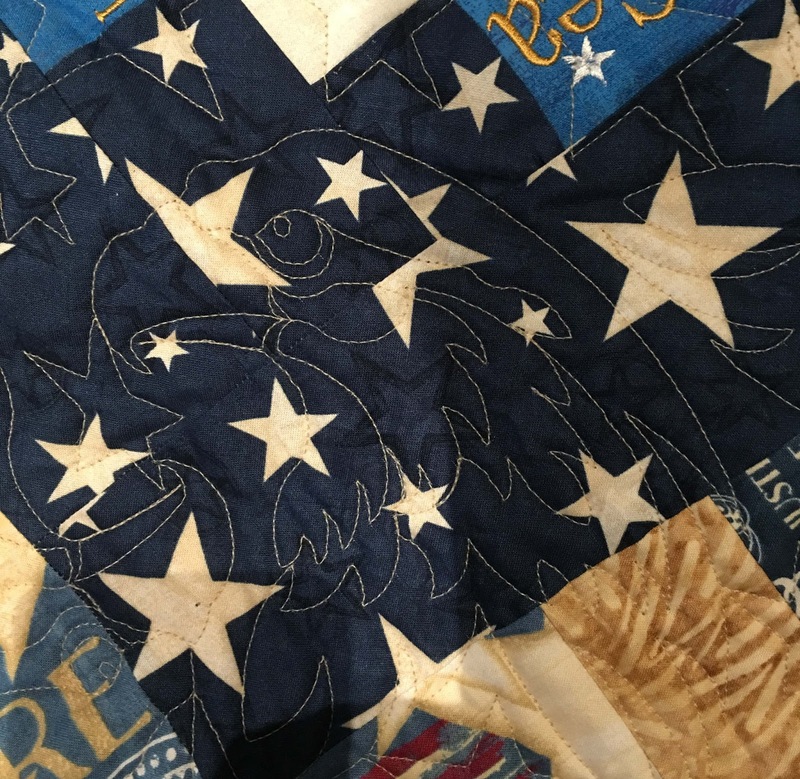 One of the best parts of the looking at this quilt is how you can find an eagle head or flag here or there! And this may surprise you, but for the embroidered label, I shopped at Embroidery Library! 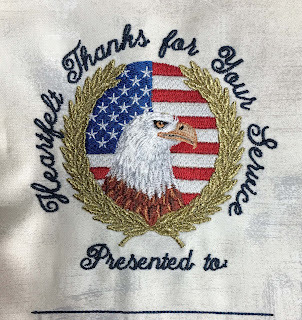 I have long believed the more embroidery available out there, makes our craft bigger and better for us all... taking the time to digitize something myself was not in the cards right now. That being said, they did call for they did call for white to be threaded FIVE times, which I would never do-- part of the fun of digitizing is figuring out like a puzzle what thread order to use to minimize that sort of thing... that being said, I'm sure the designer had their reasons, and the design stitched perfectly, even the metallic laurel... the eye on the eagle is absolutely beautifully done. I hope it finds a home with someone who has beautiful handwriting and knows what a fabric marker is-- someone who can fill in the name of whoever receives it. First and last to thank are the people at Quilt Bank on Cape Cod. First for planting a seed in my head initially, and now again for the work of giving it away. 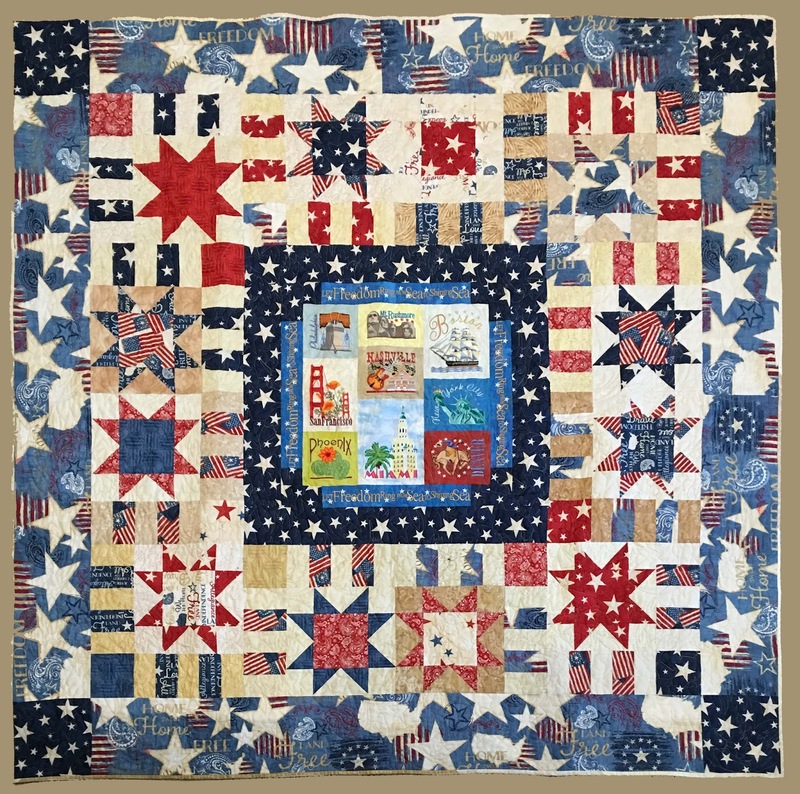 It gets delivered to them at my quilt guild on Wednesday and I would guess, not distributed until Memorial Day. 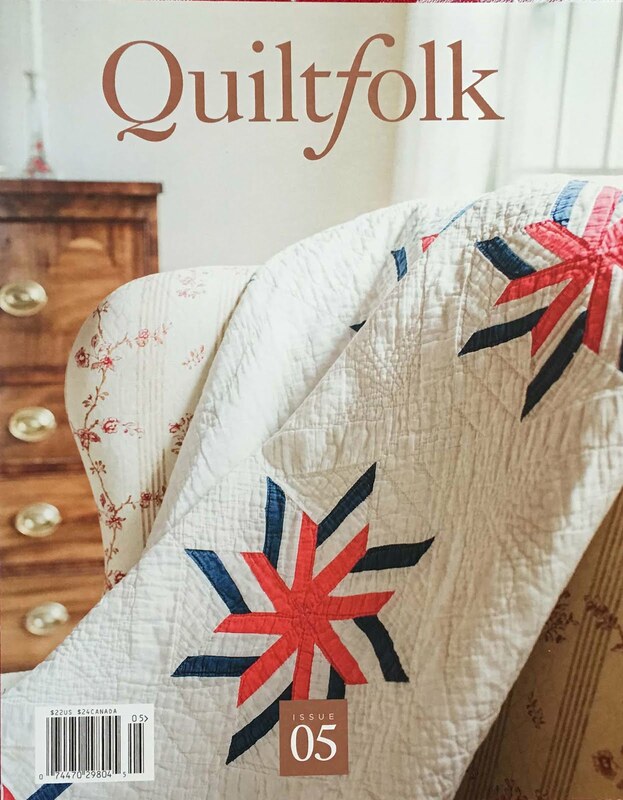 The people at Quilt Bank who collect these gather about 400 a year, so my achievement is pretty small all things considered! To me, it's just a simple thank you to all of our wonderful service men and women who are hard at work every day... and especially those on the front lines.